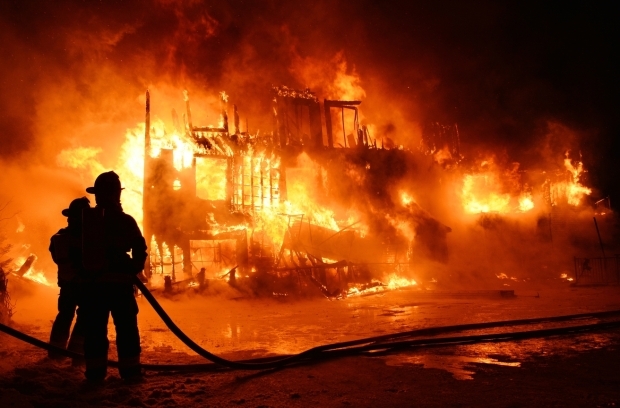 Flames engulf the Résidence du Havre seniors’ home in L’Isle-Verte, in the early-morning hours of Jan. 23. A concrete firewall protected the building’s two-storey addition. MONTREAL — In the aftermath of the L’Isle-Verte fire that killed 32 people in a seniors’ residence two months ago, one thing has come to be viewed by many as a symbol of the little that did go right on that tragic night. It’s the charred, three-storey firewall that rose from the smouldering rubble. Had that firewall not existed, it’s safe to assume that more elderly occupants of the Résidence du Havre would have perished. The firewall — erected out of concrete blocks — protected a two-storey addition that was built in 2002. The original 1997 building burned to the ground, while the firewall allowed the frailer, “non-autonomous” residents of the newer wing to escape unharmed. The self-supporting firewall also made it possible for firefighters to enter the older structure while it was burning without fear of the addition tumbling down on them. And once the fire was extinguished the next day, a forensic team was able to search for human remains while the firewall stood without risk of collapse. But that firewall has also come to be viewed by some experts as an alarming reminder of how building-code regulations can be watered down as a result of industry lobbying. That’s because under changes to the National Building Code of Canada in 2005 — after the L’Isle-Verte addition was constructed — firewalls no longer have to be made out of concrete or masonry. Firewalls can now be composed of gypsum, a widely used construction material. Some experts warn that the whitish material is not completely non-combustible when manufactured as gypsum board, that it can crack and shrink during a fire and that it doesn’t possess nearly the same strength, stability or durability of concrete. “Obviously, concrete block is more solid than gypsum,” said Edouard LaRocque, a fire-protection engineer and deputy chief of the Gatineau fire department who has taken a keen interest in the L’Isle-Verte calamity and who has spoken with some of the town’s volunteer firefighters. The story of how an arcane construction regulation gets changed usually attracts scant attention, largely because most of the work is carried out by volunteers sitting in hotel rooms. Yet many of these volunteers — who have expertise in their fields — also have vested industry interests and their building-code revisions have far-reaching implications. In the vast majority of cases, changes are made for the better and adopted without any opposition. But sometimes a change is made despite grave concerns over safety. And the revision involving firewalls in Canada did spark such concerns. It wasn’t an engineer, architect or building inspector who initially proposed that the building code be amended to allow firewalls to be made of gypsum. It was Bob Mercer, of the Gypsum Manufacturers of Canada, who made the recommendation on Sept. 27, 2000, during a meeting of the standing committee on fire safety that is part of the Canadian Commission on Building Codes. Mercer’s group is affiliated with the powerful gypsum lobby in the United States, where deregulation has gained momentum since the 1970s. Mercer proposed that the code allow for firewalls to be made of materials other than concrete or masonry, provided that the materials meet stringent standards and that they pass fire-resistance tests. In a recent interview, Mercer said his initial proposal was limited to townhouses, not all types of housing, and it was for firewalls with a fire-resistance rating of no more than two hours. That means the firewall must hold back a fire for two hours to allow for the safe evacuation of a building. Minutes of that first meeting nearly 15 years ago, obtained by The Gazette, reflect a number of concerns. “The committee considered a proposed change submitted to remove the reference to ‘masonry or concrete’ for firewalls. … The committee expressed concern with the size of fire that may develop and the impact on life safety. The proposal was debated during three more meetings over the next three years, with representatives from the firefighting sector and the cement industry raising objections. Ultimately, when the proposal was adopted in the building code in 2005, it surpassed the expectations of the gypsum industry because the change applied to all buildings, not just townhouses. Why did this happen? The building code is divided into nine sections, with Part Nine covering housing and small buildings. The gypsum industry’s original firewall proposal involved only Part Nine, but the committee reasoned that the firewall revision was more suitable for Part Three, which deals broadly with fire protection. And so by implementing the proposal in Part Three, the firewall revision ended up applying to all buildings. Although objections were raised about the transfer to Part Three, the fire protection committee concluded those objections were negligible. Gypsum’s one indisputable advantage over concrete is that it cuts down on the time it takes a builder to complete a firewall. A concrete firewall must first be erected by a stone mason or bricklayer before a contractor can put up the framing for the building. This process must be repeated for each floor. In contrast, a contractor can put up a gypsum-panel firewall at the same time as the framing goes up (see graphic). The builder doesn’t have to wait for the concrete to be poured or for the blocks to be laid. “This is economically practical,” Mercer said. “It can cut weeks of construction time” and save builders tens of thousands of dollars. The National Building Code, first adopted in 1941 and revised every five years, is not binding, but is used by the provinces as a model upon which to draft their own construction codes. Quebec adopted the firewall change in 2009. Ontario was the sole province not to adopt the change. The Ontario building code will not permit two-hour firewalls to be made of materials other than concrete or masonry for detention centres or care facilities like the L’Isle-Verte seniors’ residence. And for all other buildings, alternative firewalls must perform as well as masonry or concrete during fire conditions. Sylvain Lamothe, a spokesperson for the Régie du bâtiment du Québec, which is in charge of the province’s building code, said he could not explain the rationale for Quebec adopting the change. However, he added that all proposed revisions to the Quebec code are first studied by a consultative committee, reviewed by the Régie and open to public consultation before being approved by the government. Proponents of gypsum firewalls contend that they serve their purpose of fire resistance. Mercer has even gone so far as to speculate that had the L’Isle-Verte firewall been made out of gypsum instead of concrete, it would also have saved the lives of the seniors in the newer section of the building, and would probably have stood up after the fire was put out. “When we’re talking about a fire-resistance rating, this is a very intense fire that’s unrelenting and continually getting hotter and hotter,” Mercer explained of the testing of gypsum firewalls. “That is not the real world. The building code requires prescribed times of fire resistance that don’t necessarily equate with what a real fire would be,” he added, suggesting that gypsum can more than adequately withstand any blaze. Philip Rizcallah, a senior technical adviser for the National Research Council that oversees the Canadian building code, insisted that safety was on the minds of everyone who ratified the change. A point of contention in the debate is whether a gypsum firewall is, in fact, non-combustible. Gypsum, derived from the Greek word for plaster or chalk — gypsos — is a soft mineral. Gypsum panels used in firewalls contain glass fibres in the core for reinforcement. The outer lining of the panels are made of paper or glass. During a fire, gypsum shrinks as the water that is naturally found in the mineral is released as steam. This will crack and shrink the gypsum, and with time it will burn off. Richard McGrath, of the Cement Association of Canada, is categorical in stating that a gypsum firewall is combustible. However, both Rizcallah and Mercer maintain that gypsum firewalls are non-combustible. In the days after the L’Isle-Verte fire, much attention was focused on the fact that the older section of the seniors’ residence did not contain sprinklers. There are now calls in Quebec to have all such facilities equipped with sprinklers and even to retrofit existing buildings, as is now the case in Ontario. But there are currently no plans to revisit the firewall regulation — either at the national level or in Quebec. For Liangzhu Wang, an engineering professor at Concordia University, that’s unfortunate given our aging population and the likely increase in the number of private retirement homes in the province. Many of these properties are expected to build new additions to accommodate the influx of seniors, which will mean more firewalls.